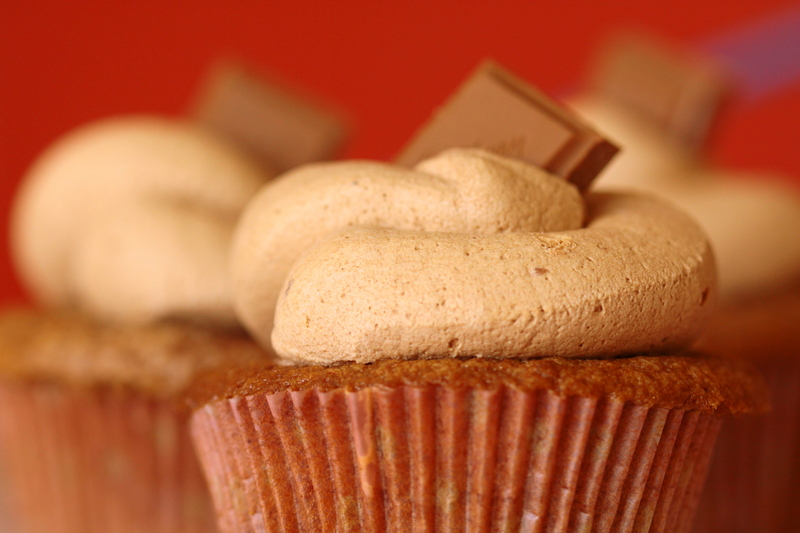 I’m on a quest to perfect a cupcake recipe using English chocolate. I’ve mentioned Paul’s love of Wispa Bars before. And although he ranks Wispas #1, his love is not exclusive. He likes all Cadbury chocolate, including Dairy Milks. A Dairy Milk bar is Cadbury’s version of a milk chocolate bar. You can find English chocolate at World Market or at your local gourmet grocer. 1) For the ganache: Place the chopped Dairy Milk in a medium-sized bowl. Heat the cream until just boiling and pour over the chocolate. Slowly stir until completely melted and lump-free. Set the bowl in the fridge to chill while you make the cupcakes. 2) Preheat the oven to 350°F and line a standard 12 cupcake tin with liners. 3) In a medium bowl stir together: salt, flour, baking soda, and Cadbury Drinking Chocolate Set aside. 4) Place the oil, butter, sugar, and eggs in the bowl of your mixer. Beat on medium speed for 2 minutes. Stop the mixer and scrape down the bowl.Add the melted Dairy Milk and vanilla. Mix for 1 minute. 5) Reduce the mixer speed to low and add half the dry ingredients, mixing only until they disappear. Scrape down the bowl and add the buttermilk, mixing until incorporated, then mix in the remaining dry ingredients. 6) Pour the batter into the tins, and bake 15 to 17 minutes. 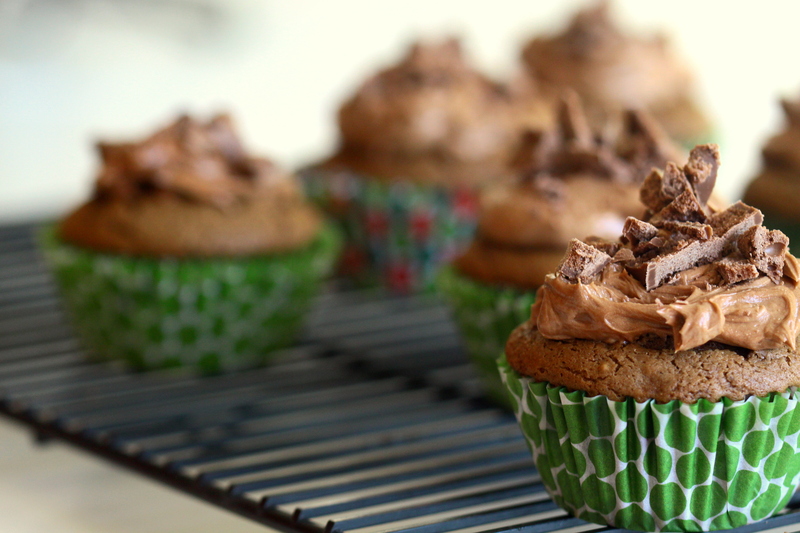 The cupcakes are done when a toothpick inserted into the center comes out clean, with just a few moist crumbs. 7) Rest the cupcakes in the pan for 5 minutes, then turn out onto a rack to cool completely. 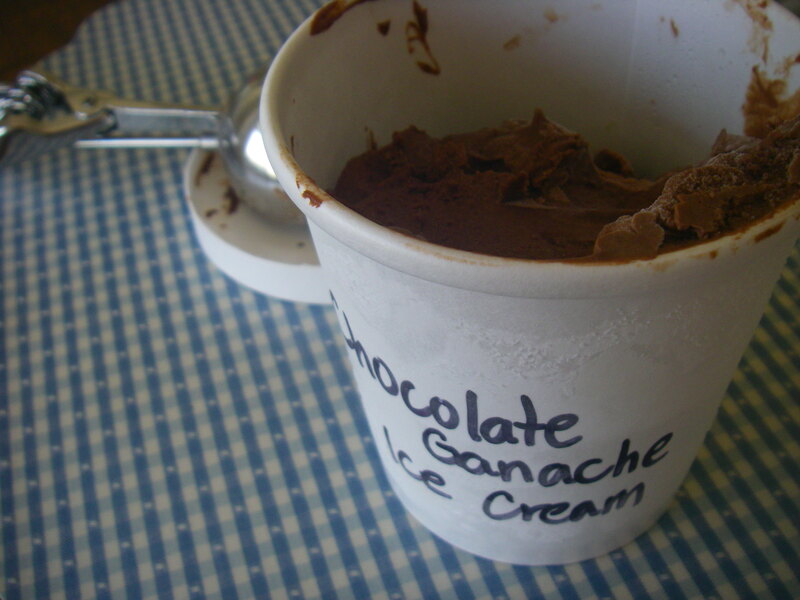 8) To prepare the ganache: The chilled ganache should now be the consistency of chocolate pudding. Place it in the bowl of your mixer and whip with the whisk attachment until thick, light, and fluffy. Be sure to scrape the bottom of the bowl to fully incorporate all of the chocolate. 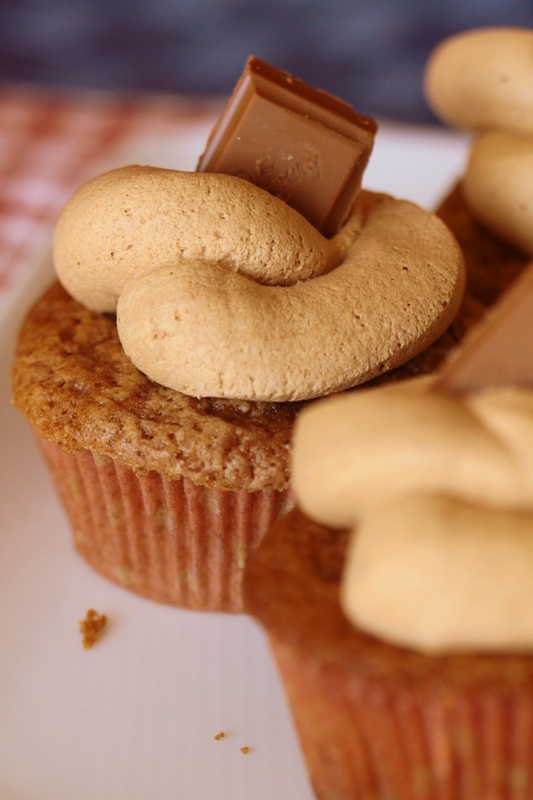 9)Place a dollop of frosting on each cupcake and top with chopped Wispa. 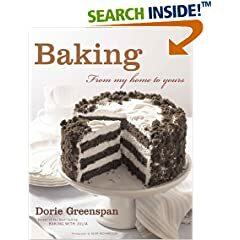 I did not intend to make Dorie Greenspan’s Torte Noire from Baking…From My Home to Yours. 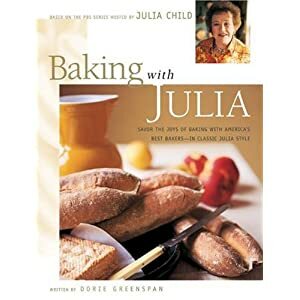 True, it’s one of the original Tuesdays with Dorie recipes I still needed to make. True, it’s very delicious–a chocolate ganache tart with a chocolate crust. It didn’t strong arm me nor show up at my office begging me with a raspy voice like an old-school femme fatale. It simply was a matter of convenience. I had leftover chocolate dough from chocolate truffle tarts. I wanted to use it to make a tart or something similar out of TWD v1.0 to cross another recipe off the list. I made two mini 4″ tarts–one for Paul, one for me–and made 1/4 of the recipe for the filling. 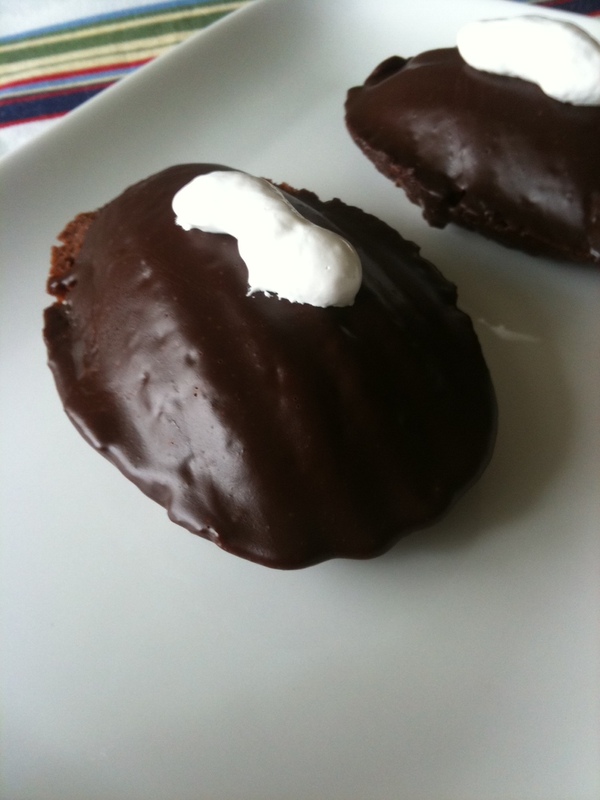 The filling is a simple ganache with nothing simple about the taste. Because of the rainy day and rushedness (new word!) of the photo shoot, we didn’t get any good shots. Paul’s solution? 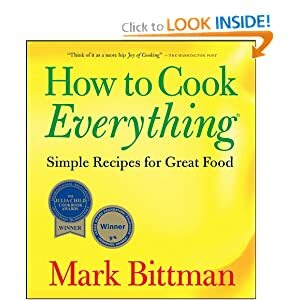 “You’ll just have to make these again.” And we will. 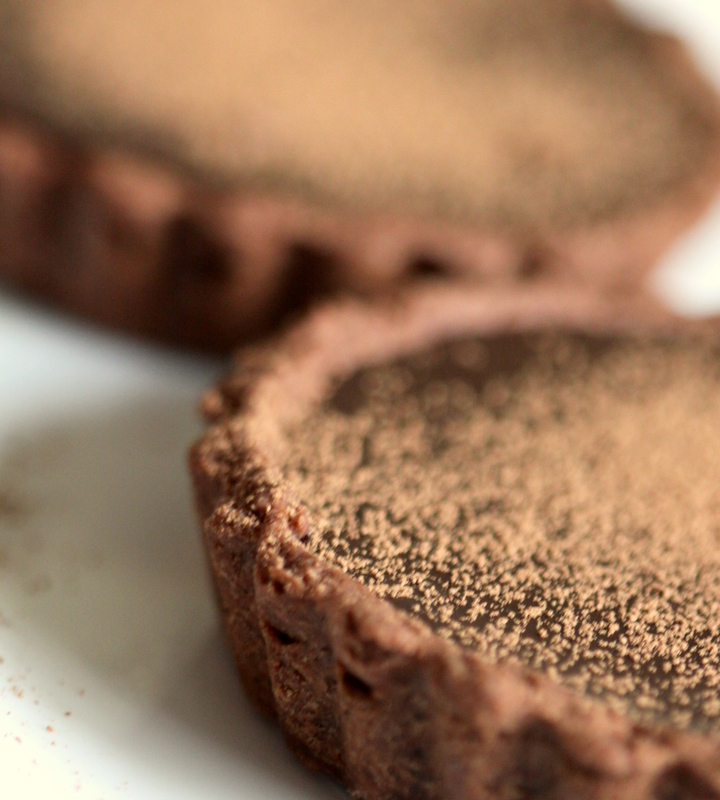 It’s the little black dress of chocolate tarts. Not fussy, perfectly simple, and with great taste. The TWD bakers made the tarte back in July 2010 when I was still baking with the group and I don’t recall (other than my life was a mess) why I didn’t make it then. Dharmagirl of Bliss: Towards a Delicious Life hosted the TARTE NOIRE RECIPE. Not a whole lot of ingredients, intense chocolate taste, and a perfect summer treat. 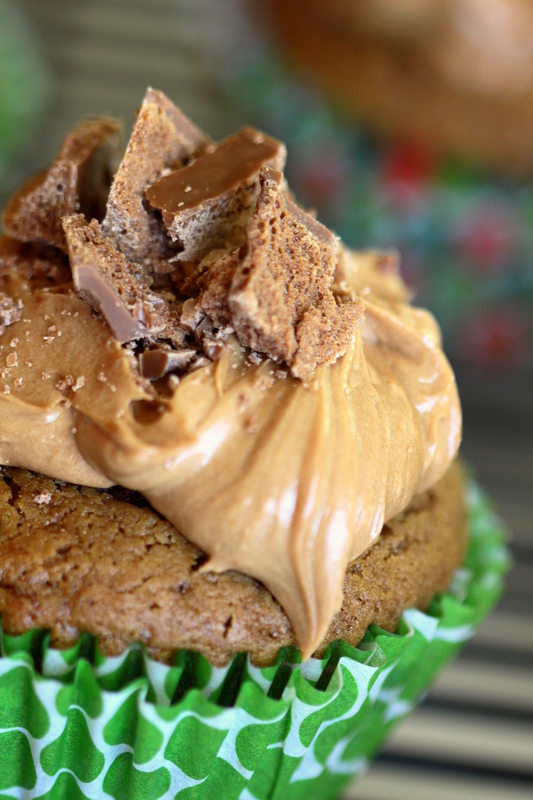 This week’s Tuesdays with Dorie is a perfect dessert for hot August nights. Actually, is there ever a bad time for ice cream? I don’t think so. 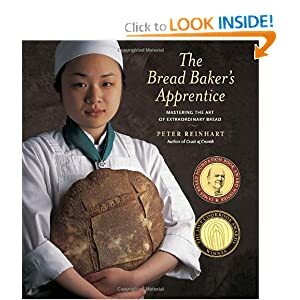 Thanks to ﻿﻿Katrina of Baking And Boys! for hosting this week’s recipe, Chocolate Ganache Ice Cream. 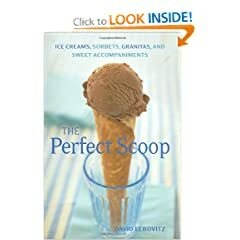 She’s an awesome mom and loves chocolate and ice cream so it was a no-brainer for her. 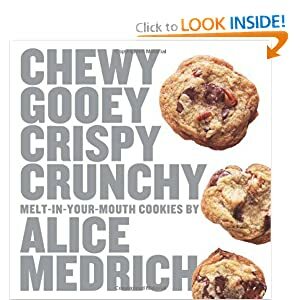 For the recipe, visit her blog or buy the book.